They say a week is a long time in politics (at the moment a day can feel like a long time). The same isn’t often true about economics. Arguably the most important forces in economics are long-running; demographics, big infrastructure projects, technological change. Things that don’t happen overnight. Therefore this blog – the latest in the current series on social housing – takes a longer view at our housing stock. Two drivers are likely to have a big impact on our housing need in future. The first is demographics; the fact that we’re an ageing society. The second is our failure to properly invest in housing, particularly social or ‘sub-market’ housing. Between 2003 and 2008 the stock of sub-market homes fell by 250,000. Although numbers have risen since, there are still 130,000 fewer sub-market properties in Great Britain than there were in 2003. Perhaps unsurprisingly the share of the population in social housing has fallen from 17 per cent at the turn of the millennium, to just over 13 per cent today. Compared to the situation for other generations, at the same age millennials are particularly unlikely to live in sub-market housing. And because homeownership rates have plummeted for this group, young people today are more likely to live in overcrowded, privately rented, accommodation. While these two forces are certainly being felt in the here and now, their impact will grow. In previous research we showed that a future where more of the population are retired, and more retired people rent privately, may also be one where we spend a lot more on housing benefit for pensioners. This is just one possible scenario – policy makers may choose to address the issues of housing security, quality and affordability for those priced out of homeownership and into private renting, by building more sub-market homes than we are currently doing. But if they do not a far greater proportion of pensioners will end up renting privately in future. Based on our estimates below almost a fifth of millennials may end up in the private rented sector (PRS) in retirement. This would take us back to the situation in the late 1970s, when there were far more pensioners in the PRS, and sub-standard housing was a major issue for this group. Another thing often said about politics is that it is about choices (and not just the choice of what type of Brexit we want). And though we’re unlikely to have much choice in how much society ages in future we can decide how to respond. At the moment we’re on course to respond by increasing spending on housing benefit. Using our projections for homeownership out to 2060, per claimant spend on housing benefit and current rates of sub-market home construction we produce five possible scenarios (outlined below). For each of these scenarios about the world in 2060 we assume that in future we need to maintain the current ratio of benefit units (families) to dwellings. The first scenario is that millennials enjoy the same tenure mix in retirement as the current retirees. This would mean that 22 per cent of pensioner families rent in retirement, of which 16 percentage points rent socially and the remaining 6 percentage points rent privately. Because the pensioner population will be larger in 2060 we’ll need to build an additional 9,000 sub-market homes a year above that which we’ve achieved over the past five years when we averaged 13,000 a year (22,000 in total) and housing benefit spending on pensioners would rise by 70 per cent because there will be more people renting privately in retirement. However, it’s unlikely that tenure patterns will be the same in four decades time. Given current trends it’s doubtful that as many millennials will own their own home in retirement as today’s pensioners do. 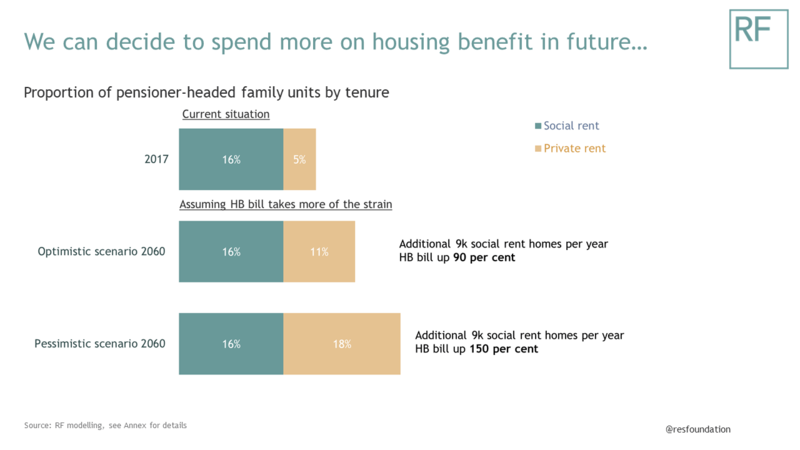 Assuming a relatively small increase in the proportion of pensioners renting in retirement, from 22 to 27 per cent, government could house this population by spending more on housing benefit. We’d still have to build an additional 9,000 more sub-market homes from now until 2060 (22,000 in total) and the pensioner housing benefit bill would rise by 90 per cent. Assuming that just under three quarters of pensioners are homeowners in 2060 may be unrealistically optimistic though. Under a more pessimistic scenario – where around two thirds are homeowners – the pressures on the housing benefit bill will be greater. Under this scenario we project that if the government does not expand genuine social rented accommodation (beyond the 9,000 a year increase required to meet population growth) it will need to spend an additional 154 per cent on the pensioner housing benefit bill. 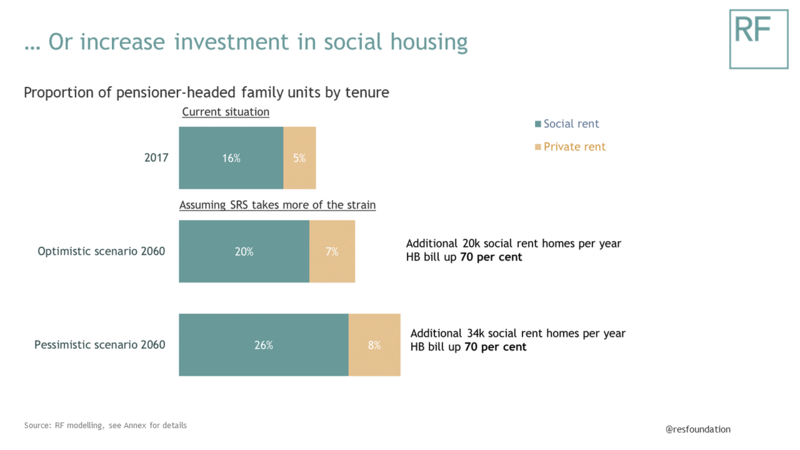 By contrast the social rented sector could take more of the strain. Under our optimistic scenario (where the proportion of pensioners renting in retirement rises from 22 to 27 per cent) we could choose to expand genuine social rented housing by building a further 20,000 homes a year (33,000 in total) and this would limit the rise in housing benefit to 70 per cent. Under the more pessimistic ownership scenario the pressures for rental homes will be greater. Under this scenario we project that, in order to limit the rise in housing benefit to 70 per cent, the government would need to build an additional 34,000 (47,000 in total) homes for social rent a year. ‘Sub-market’ describes social rented, affordable rented and intermediate housing, provided to eligible households whose needs are not met by the market. That is people renting from social landlords – local authorities or housing associations. In what follows we restrict our analysis to the pensioner population and a time when the vast majority of millennials will be in retirement (2060), and so this analysis is different to recent research by Shelter that has tried to estimate the social housing need for the whole population in the more immediate future. Due to the housing benefit savings associated with housing people in genuinely social rented properties, which we discuss here. Read the full methodology for this analysis.